Yannick is 38 and lives in Sion Valais, he started to become enthusiastic about aviation at age 13 when building and flying his first radio controlled aircraft models. his career at Crossair where he became, at just 26, one of the youngest Captains on 100 seat jet aircraft. He does still fly gliders and aircraft aerobatics and his other hobbies are mountain biking, snowboarding, reading, architecture and travel. First of all, to avoid that the names of the pioneers who opened the way fall totally into oblivion. Then, by flying Ecolight / Light Sport aircraft, demonstrate that we can do more with less, reducing the negative impact of man on our fragile planet. Finally, to fulfill a dream and maybe encourage others to do what it takes to fulfill theirs. started when he was a kid. 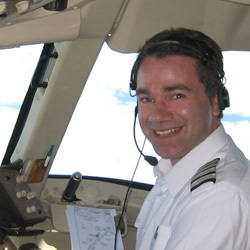 After completing an ETS Engineering degree he decided to become a bush pilot, initially in North Canada and a few years later in Africa for the United Nations. After returning to Europe, he flies as an Airline Pilot for TEA, Swissair and Privatair. In Switzerland, at the age of 28, he becomes the youngest Captain to fly an aeroplane weighing more than 100 tons. In 2000, Francisco creates the « Super Constellation Flyers Association » which operates one of the last two airworthy Lockheed Super Constellation in the world. In 2007, he buys a derelict Douglas DC-3 and intends today with friends to restore it to flying conditions. In order to improve his technical knowledge, Francisco joins in 2006 the prestigious National Test Pilots School (NTPS) in Mojave, California. Fluently speaking 5 languages, he loves to travel and has been already 6 times around the World flying an airliner.... but never with an Ecolight ! Today, Francisco has accumulated over 10'000 flight hours in 42 different aircraft types. 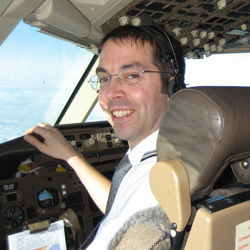 He is today Captain and Flight Instructor on DC-6, DC-7, L-1049 and B757. For Francisco, sharing this fantastic Ecolight world tour with his friend Yannick is the dream of a lifetime !